Every time I hear the word "arugula," I think of the movie My Blue Heaven with Steve Martin. I was too young to really appreciate the film the first time I saw it, but the scene in the grocery store where he asks for arugula has stuck with me for the past 25 years. "It's a veg-e-ta-ble." 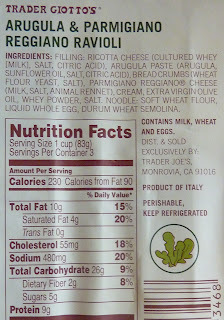 And apparently "parmigiano reggiano" is just a fancy way to say "parmesan cheese." But put together like that, it's pretty hard to speak the title of this product without trying to sound like an Italian mafia don from New York City. 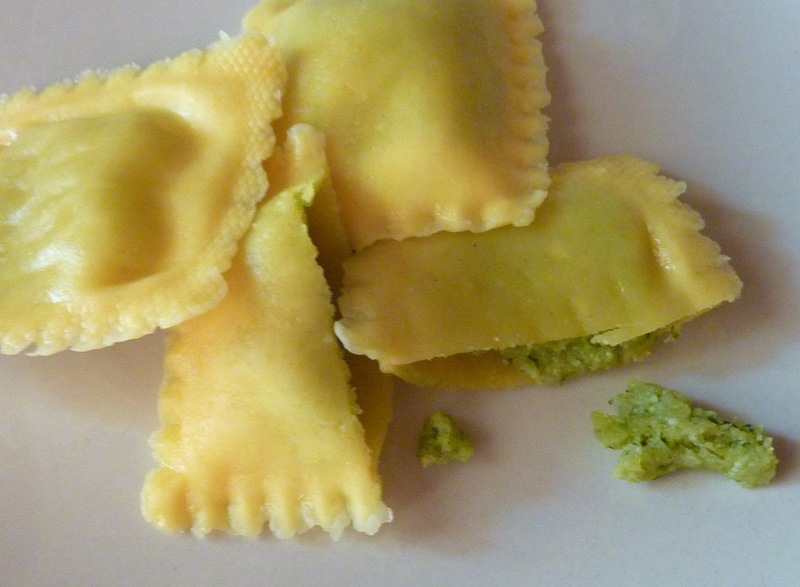 Near the end of a recent podcast episode, you can hear my sad attempt at saying "Trader Giotto's Arugula & Parmigiano Reggiano Ravioli" with an Italian accent. And if you like that, please check out my even-more-offensive Indian, Danish, and Japanese accents on our YouTube channel. Whether you say it with an Italian accent or can barely pronounce it at all, you have to admit that arugula and parmigiano reggiano is a great combo. And it's even better inside ravioli pasta. It's a far cry from the bizarre "fusion" experiment we recently checked out called Trader Joe's Chicken Pot Pie Ravioli—admittedly, a mostly successful experiment. But this product tastes classic...like a time-honored family recipe from the Old Country—not that I know anything about the Old Country. I'm about as Italian as the Queen of England. But it tastes like something that you'd get from a mom and pop's Italian place. Not a hole-in-the-wall pizza place, either. Like maybe The Olive Garden, but much better. It's a delicious, balanced blend of veggies, cheese, and pasta, and it goes great with olive oil and Trader Joe's Shaved Cheese Blend. All of the flavors are somewhat subtle, but very pleasant. They go together so well because no single ingredient outshines the others, taste-wise. 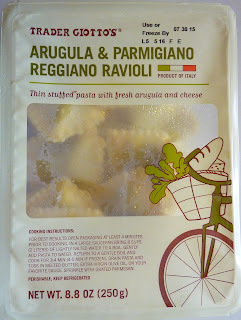 The amalgam of parmesan and arugula is nice and smooth. There are no chunks of veggies or cheese. They're blended together to an almost creamy consistency. There's definitely a little more substance to the mixture than just plain cheese by itself, but it's not a "chunky" experience by any means. Even the Chicken Pot Pie Ravioli had more body to it, since there were hunks of carrots and peas and tiny whispers of chicken in that product. We enjoyed the texture in both cases, but for different reasons. 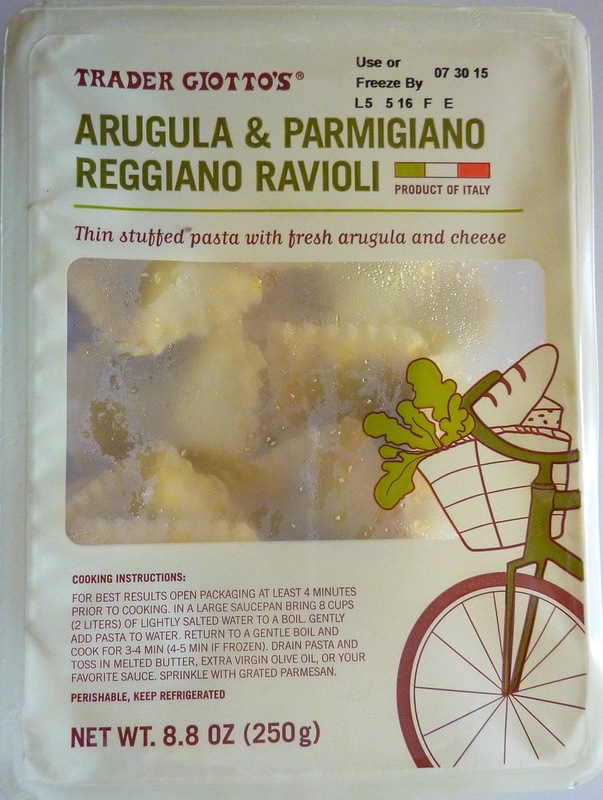 This pasta is easy to prepare and reasonably priced at $3 for the package. Sonia and I both recommend it. 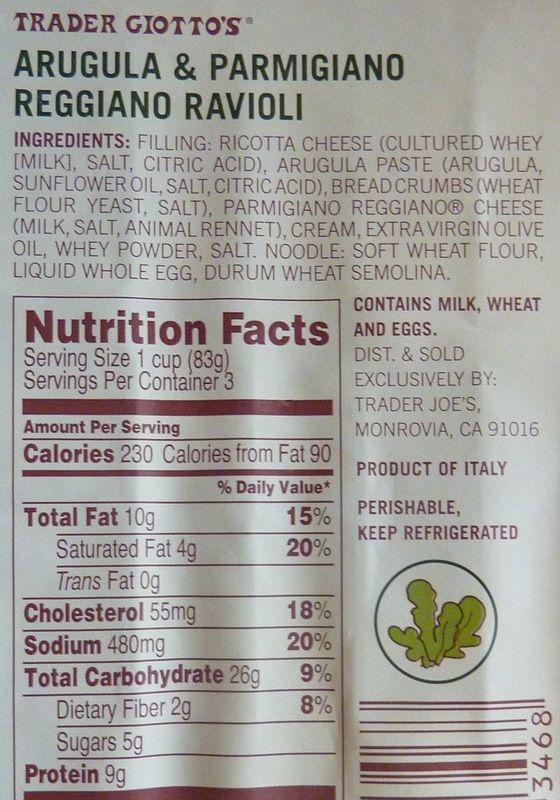 u can't go wrong w/arugula and parmigiano!... the only issue i have is that it's refrigerated pasta... sometimes after cooking, the pasta seems hard/rubbery... fresh is always the way to go..
That fancy pasta plating, with the ravioli cut just so, revealing its bright green interior had me thinking you guys were moving from humble TJ fan bloggers to full on snooty foodies....and then you hailed Olive Garden. ;-) I'm still sold. lol tiga. Granted, I did say "much better than" Olive Garden, but yeah...that's my reference point. But Sheilas isn't gluten free and the infre and nutrition is different. Am I missi something?